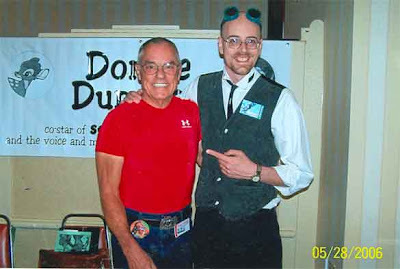 I had the pleasure of meeting Donnie Dunagan a few years ago at the Wonderfest convention in Louisville, KY. This was in 2006, and Donnie had just started doing the convention circuit at that time. Donnie had not made any movies since he was a child actor, and in fact had put that part of his life well behind him until my pal, Tom Weaver, tracked him down for an exclusive and extensive interview for the book “Earth vs. the Sci-fi filmmakers.” Tom is one of the best writers in the business, bar none, and after talking with Donnie for a while he convinced him there are lots of folks who would be very interested in hearing his stories of his time in Hollywood. Donnie may have only made a few films, but he got to act with some of the biggest names in the business. 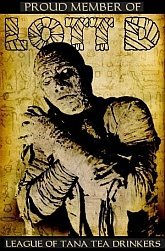 He appeared in Son of Frankenstein alongside Basil Rathbone, Boris Karloff, Bela Lugosi and Lionel Atwill. Donnie was born August 16th, 1934, so he would have been 4 or 5 yrs old at this time. SOF was released in Jan. 1939. He also appeared in Tower of London, which was released in November of 1939. That would put him at age 5, most likely, when that one was shot. 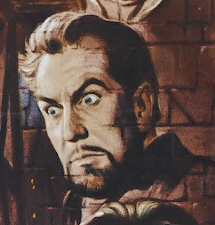 He once again got to act in that film with Basil and Boris, as well as the one and only Vincent Price! In 1942 Donnie appeared as the voice of Bambi, making his biggest role one he was never seen in, only heard. Tom and Donnie touch on all these and much more in Tom Weaver’s interview. I had the honor of doing a Q&A with Donnie at Wonderfest before a good sized crowd, and let me tell you – he is one entertaining fella! He has some great stories and both he and his wife are two of the nicest folks you’d ever want to meet. 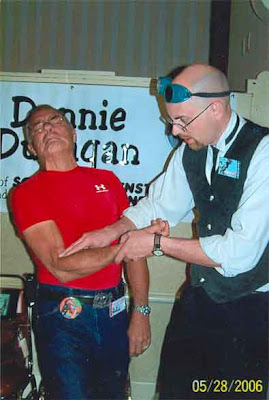 I'm goofing around with Donnie in the pic below, checking his blood pressure...which is pretty funny, because Donnie, at age 72 at the time these were taken, looks fitter than me! This guy has taken care of himself - I only hope that I am half this fit when I reach his age!